Nokia continues to be at the top having dropped off 1% market share. 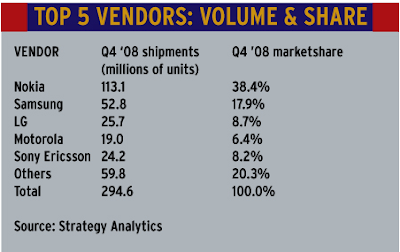 Of the five top-tier handset vendors, only Samsung and LG shipped more handsets in the fourth quarter than in the preceding quarter, bucking the industry trend of a 5% market contraction. Strategy Analytics revised its forecast for 2009 to negative 9% growth roughly in line with Nokia’s forecast of negative 10% delivered and said that the year would be the weakest for handsets since the modern mobile phone industry emerged in 1983, a quarter-century ago.